On 2 March 2015 JustSpace submitted the following short comment in response to the Mayor’s consultation draft City Fringe Opportunity Area Planning Framework. For a proper consideration of its content, strategies and proposals, there is a need to have knowledge of: the array of Masterplans, Local Plans, Action Area Plans… (vide para 5.55, p. 58). To gain an appreciation of these is made more difficult and time consuming because of the 3 boroughs involved;and the the functional and geographical areas, the localities and neighbourhoods – and this would mean all of the OA, rather than the ‘local patch’ knowledge that individual amenity/community groups would have, for various reasons. This Framework has a Vision (para 1.54, p.12) to enable business growth that has spatial/land use consequences for all of the OA. 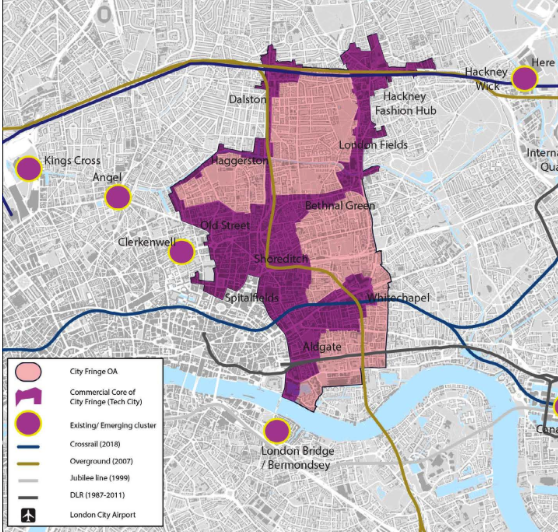 It seeks to ensure a consistent approach across the 3 boroughs (Strategy 1, para 1.57,p.12) and its primary aim (para 2.2, p. 16) is to create a positive environment for employment growth in the City Fringe. For local communities to marshall their resources during the consultation has proved impractical, particularly as no evidence has been brought forward to demonstrate that communities have been involved, unlike those mentioned as part of the wider stakeholder group (para 1.3, p. 2). Given the hetrogeneity of the OA, consistency of approach is an inappropriate strategy. However, a coordinated approach would better fulfill the purpose of the OAPF to elaborate and guide development plan policies . This is not simply a matter of semantics as this goes to the heart of the intent and purpose of the Planning Framework which, given the nature, characters, scales and extent of the OA, should enable a variety of locally appropriate responses to flourish. Consistency of approach conveys something entirely different. The resulting Strategy 3 (para 3.7, p28) begins with the stated need for development to facilitate economic growth without the necessary qualification and recognition that sustainable development is the goal of the planning system and that the achievement of this should frame this facilitation. Given that the OAPF is to be delivered in partnership with the local boroughs (p.viii), the cited Implementation Chapter 6 is relatively underdeveloped and does not articulate much more than a listing of funding streams. More should be said on the mechanisms for cooperation, monitoring and review, as promised on p.viii (“in detail”), together with an explanation of more effective and continuing community engagement. This chapter is crucial to the OAPF but it has been inadequately and carelessly attended to as at para 6.20 (p.90) with its reference to LBE and at paras 6.37 & 6.38 to Ealing and Southall. This evidence of cut and paste from another OAPF undermines the credibility and standing of the City Fringe document. The Implementation paragraphs of the Executive Summary describe the Framework as “the plan”. If it is a plan and it does have maps clearly setting out spatial expressions, (including the identification of sites) of its content, then it should be subject to the formal procedures of plan-making with examination in public to form part of the development plan for London. Consideration should be applied to the need to subject this plan to a SEA having regard to its environmental impact. Correction is also needed to Chapter 1’s Fig 1.3 ‘Material Weight of the Framework’ which incorrectly depicts the planning hierarchy and material weights. Neighbourhood Plan is not on the same level nor does not have the equivalent weight of SPG or OAPF; it is actually at a higher level/has greater weight because a “Neighbourhood Plan forms part of the development plan and sits alongside the Local Plan prepared by the Local Planning Authority.” (National Planning Guidance ref 41-003-20140306). It should be in the diagram’s box ‘The Statutory Development Plan’. Additional comment from Robin Brown of Just Space: It seems to me that the GLA are attempting to counter the voracious demands of residential led development, as amplified by the 2013 permitted development rights for office to residential conversion, to protect the supply of employment land supported by their commissioned demand side appraisal. And that their draft policy at paras 2.16 & 2.17 detail the requirements on incorporating affordable workspace (in the core growth areas – map 2.3- roughly approximate to the permitted development exemption area).